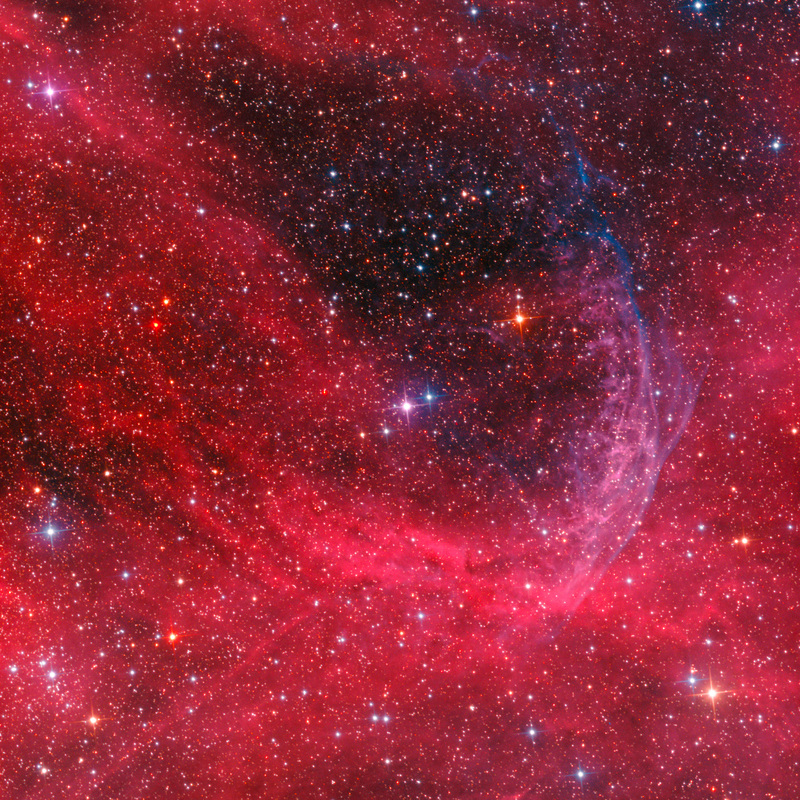 Wolf-Rayet (WR) stars produce powerful stellar winds and contribute chemical elements to the interstellar medium (ISM). They represent a phase in the evolution of very massive stars. Most are believed to be headed toward a Type 1b or 1c superova. Only 10% of WR stars have nebulosity surrounding them, referred to as a WR Ring Nebula (Esteban and Rosado, Astron. Astrophys. 304, 491-504, 1995). The Crescent Nebula (NGC 6888) in Cygnus is another well-known, often-imaged example. The nebulosity can be measured spectroscopically with large, professional telescopes to study how these supersonic winds interacted with the ISM. Other WR Ring Nebula are more difticult to detect. They are embedded in surrounding hydrogen nebulosity, as is the case for WR134, where it formed into the surrounding gas of the Cyg OB1/OB3 association, specifically near the SW boundary of the Cyg OB1 IR supershell. It has carved out a cavity, as can be seen in the image above. There are some suggestions that it is a binary star system with a measured periodicity of 2.25 days, and may have a collapsed companion star. WR134 (HD 191765, WN 6 type star) is at the center of the above image, and is the brightest of the four stars there. North is toward the upper right and the field is about 35′ x 35′. This region is only about 2 degrees south of the Crescent Nebula. The WR ring nebula shows an arc in the SW (bottom) enriched in hydrogen that is shown by the H-a emission. This arc continues up toward the NW (right), but becomes enriched in OIII. The entire nebula is embedded in the rich Cygnus H-a nebulosity. High-contrast narrowband data from 3 nm OIII and H-a filters bring out the structure of the nebulosity. They were combined in such a way to produce “natural” color. Star colors were added from RGB data.